Publisher's description: Few books have ever made their presence felt on college campuses—and newspaper opinion pages—as quickly and thoroughly as Richard Arum and Josipa Roksa’s 2011 landmark study of undergraduates’ learning, socialization, and study habits, Academically Adrift: Limited Learning on College Campuses. From the moment it was published, one thing was clear: no university could afford to ignore its well-documented and disturbing findings about the failings of undergraduate education. Now Arum and Roksa are back, and their new book follows the same cohort of undergraduates through the rest of their college careers and out into the working world. 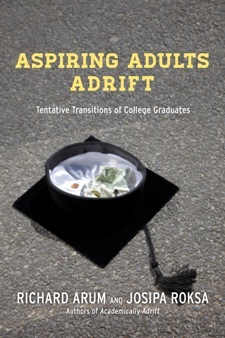 Built on interviews and detailed surveys of almost a thousand recent college graduates from a diverse range of colleges and universities, Aspiring Adults Adrift reveals a generation facing a difficult transition to adulthood. Recent graduates report trouble finding decent jobs and developing stable romantic relationships, as well as assuming civic and financial responsibility—yet at the same time, they remain surprisingly hopeful and upbeat about their prospects. Analyzing these findings in light of students’ performance on standardized tests of general collegiate skills, selectivity of institutions attended, and choice of major, Arum and Roksa not only map out the current state of a generation too often adrift, but enable us to examine the relationship between college experiences and tentative transitions to adulthood. Sure to be widely discussed, Aspiring Adults Adrift will compel us once again to re-examine the aims, approaches, and achievements of higher education. For more information about this book, visit highered.ssrc.org or the publisher's website. Arum, Richard and Roksa, Josipa, Aspiring Adults Adrift: Tentative Transitions of College Graduates (University of Chicago / University of Chicago Press, 2014), http://highered.ssrc.org/publications/aspiring-adults-adrift/.